Although the Rising Sun is still there the other buildings in this photograph are long gone. Behind the signpost the building on the corner of what is now the open space of Sun Corner has been removed. Beyond the Rising Sun the house, black gable end showing, has gone and been replaced by an area on which cars are often parked. In the background are other houses which have been replaced by Albion Court. The Rising Sun has altered a little. The sign which used to be at the London Road end of the building is now more central and the pub has lost it’s porch. Note that the roads are unsurfaced. At one time there was a set of traffic lights at the bottom of the High Street which controlled the traffic quiet well until Laindon Road was altered to allow the Fire Service a swifter access to the High Street. The traffic lights were then replaced by a roundabout which, soon after its construction, had a white W.C. pedestal in its centre. Quite convenient I suppose. 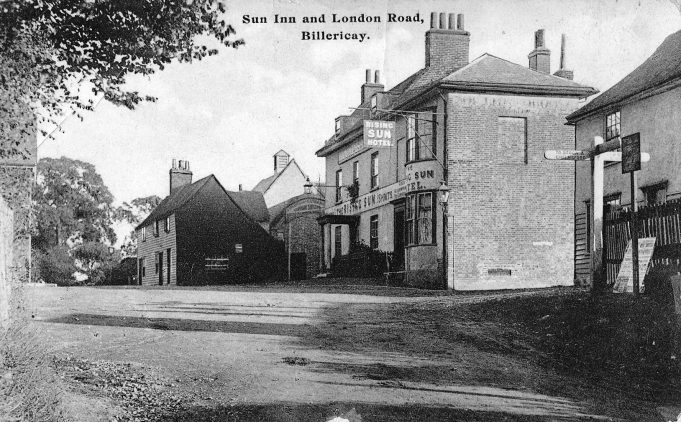 I remember when there was no traffic lights at Sun Corner, and on High Days and Holidays my father who was a Special Constable for Billericay would don his white gloves and armlets and carry out point duty in the middle of those crossroads. Sometimes it would be done by Jim Childs who was a caretaker at Billericay Secondary School. I can remember when traffic lights were first installed here. A policeman came along to the Junior School in Laindon Road and explained to Miss Ager’s class how they worked and how we should cross the road. The tall building to the left of the pub with the triangle topped structure on top was I think part of the gas works which was also pulled down. There were doves living in it at the time that they were giving away prior to demolition. We had a few in our garden at Millers in Southend Rd for a while. In the 1930’s the house with the black gable end was lived in by a lady called Mrs Child and her son who was known as ‘Coupper’.